Science has proven that the Earth’s climate is changing. 97 percent of actively publishing climate scientists agree that human activity is the cause for change. According to NASA, climate change will drastically reshape the planet in the years to come. This change will consist of rising temperatures, rising sea levels, melting ice caps and ultimately damage to the environment and wildlife, which can also pose extreme risk to human communities and public health. According to the Yale Climate Opinion Maps, only 41 percent of Georgians believe global warming will harm them personally. Furthermore, only 51 percent believe it is already harming people in the U.S. The reality is the majority of Georgians are wrong and climate change is already harming people in the U.S., according to several local climate experts. “It is already affecting local communities,” Kim Cobb, a climate scientist from Georgia Tech and director of the Global Change Program, said of the Georgia population. According to the U.S. National Climate Assessment, the Southeast is at severe risk to three major results of climate change: sea level rise, increased temperatures and water availability. Georgia threats are specifically outlined on the States at Risk website, developed by Climate Central, an organization comprised of scientists and journalists. The identified threats are extreme heat, drought, wildfires and inland and coastal flooding. “We have seen several particularly active hurricane seasons recently, which has caused increased coastal flooding,” Cobb said, illustrating a rise in extreme weather events. “This has really brought into focus the vulnerability of our coastal presence,” Cobb said. Cobb said that this increased activity can result in inland damage, with profound lasting damages to Georgia farmers. Hurricane Michael, which hit Georgia early last month, destroyed $1.2 million worth of crops in the state. Only 15 percent of cotton, Georgia’s No. 1 crop in production value, was saved and harvested before the storm hit. But, it isn’t at all unusual for hurricanes to damage crop production in Georgia. In 2016, Hurricane Matthew had a lasting impact on another key crop in Georgia: pecans. Farmers lost as many as one-third of their pecan trees, which take up to seven years to grow and produce again. Some of those trees were older than 100 years. “They are already talking about increasing prices in certain food categories, both here, and across the nation, given the importance of Georgia agriculture,” Cobb said. With increased intensity and frequency, the Georgia economy could be increasingly impaired. A 2017 study compared the future of ten metropolitan cities, including Atlanta, in best and worst-case scenarios for greenhouse gas emissions and temperature increases. In Atlanta, the study saw a decrease in heat-related deaths under the best-case scenario but an increase in heat-related deaths in the worst-case scenario. This study demonstrated that whether actions are taken to limit greenhouse gas emissions now likely will determine whether things get worse or better. Higher temperatures can result in an increase in respiratory disease, which can be exasperated by global warming in the future. A study based in Atlanta found that under temperature extremes, non-white children, as opposed to white children, saw higher rates of emergency department visits for asthma from aggregate data from 1993 to 2012. Cobb emphasized the importance in helping communities gain access to cooling shelters to mitigate illness and mortality. An increase in maximum temperature results in more emergency department visits in Atlanta for a variety of diagnoses including heat illness, fluid or electrolyte imbalances, renal diseases, asthma or wheezing, diabetes and intestinal infections, according to a 2016 study. “It’s not a matter of ‘if,’ it’s a matter of ‘when’ these communities are coming under really intense threats,” Cobb said. 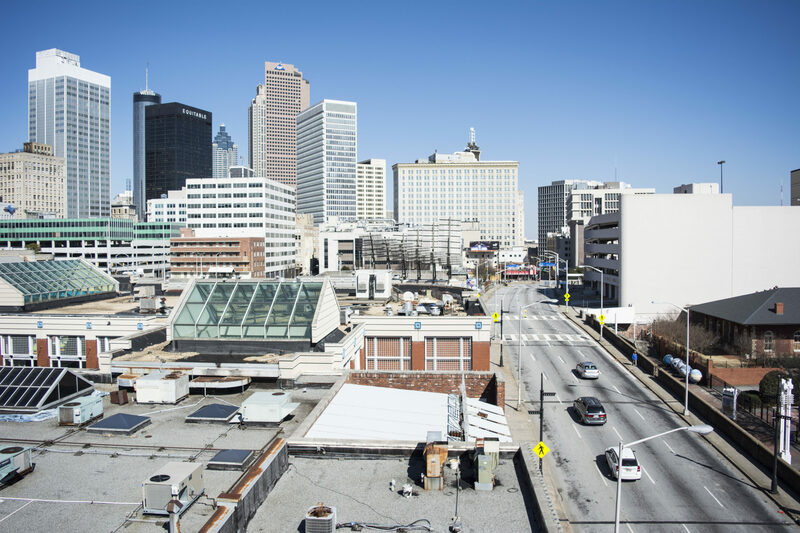 Thankfully, there are local organizations trying to preemptively address these issues, such as the Center for Sustainable Communities in Atlanta, which Garry Harris is the managing director for. “Our primary goal is this: Building a weather-ready nation for all,” Harris said. He said that there are a few communities they look out for most, as they are more susceptible to harm, these being lower-income, minority communities and what he called “vulnerable populations”: youth and senior citizens. “It’s the youth who are most impacted by severe weather, because of impact to schools, disconnection from family,” he said. Two years ago, his team visited the Georgia State campus for an emergency preparedness exercise, which gathered local officials for a campus-wide exercise that simulated a tornado strike. “We send out teams of students to lower-income areas and pass out literature on how to make their community more climate resilient,” he said. The Nature Conservancy’s Growing Leaders on Behalf of the Environment internship program is one way students at Georgia State are tackling local climate change. Allen said that as the population of Georgia rises, it’s important that action is taken to make communities resilient against climate change. “Students can lead the charge to normalize conversations about climate change which is the first step toward breaking the misconception that no one cares about it and nothing can be done,” Allen said. What are the most effective methods in Georgia to build resilience in the healthcare and public health systems to protect at-risk communities from climate change? What are immediate steps that policy-makers at all levels can take to implement climate mitigation and adaptation solutions? How will local, regional, and international displacement of people by climate change-related events affect Georgia?